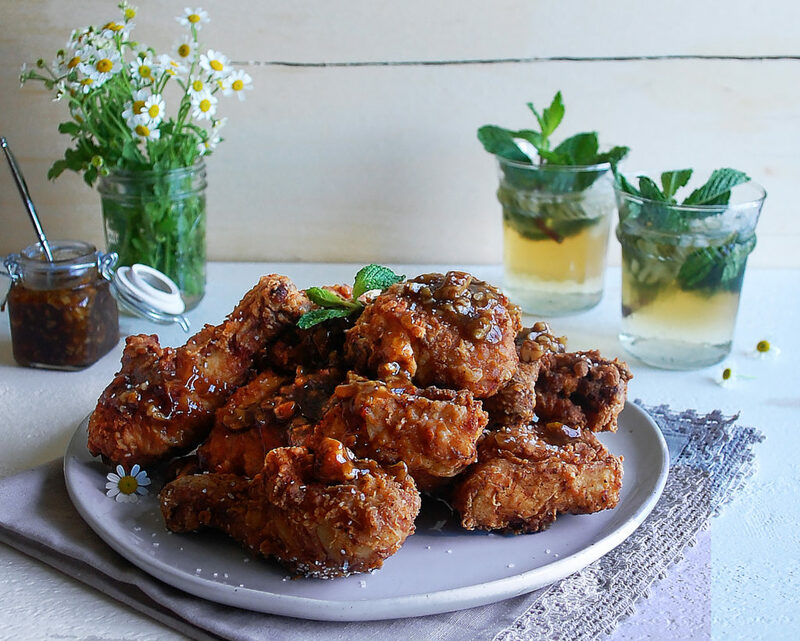 I needed a last-minute Kentucky Derby dish, so obviously that meant fried chicken and lots of bourbon. I’ve been dying to make fried chicken and the Kentucky Derby was the perfect excuse. 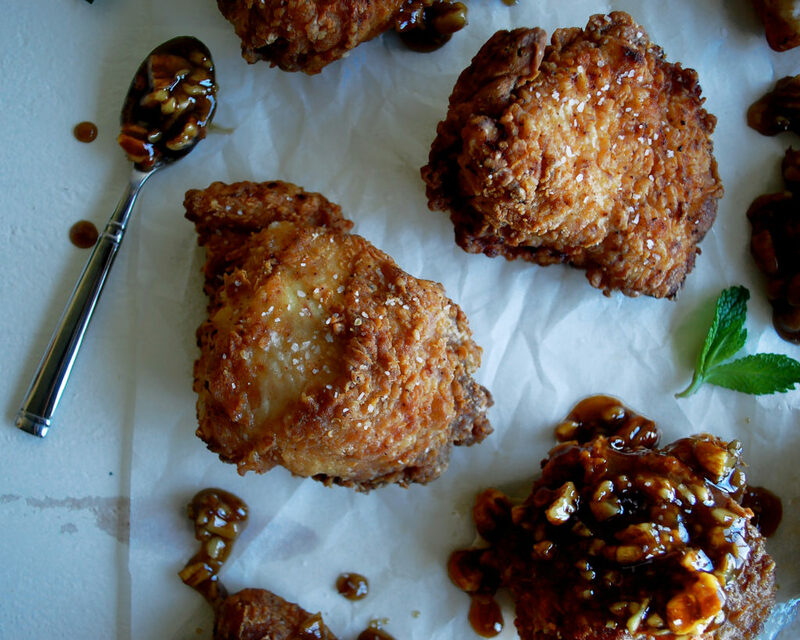 When I was out in California for the Worlds of Flavor event, Chef Asha Gomez from Atlanta made the most life-changing fried chicken. 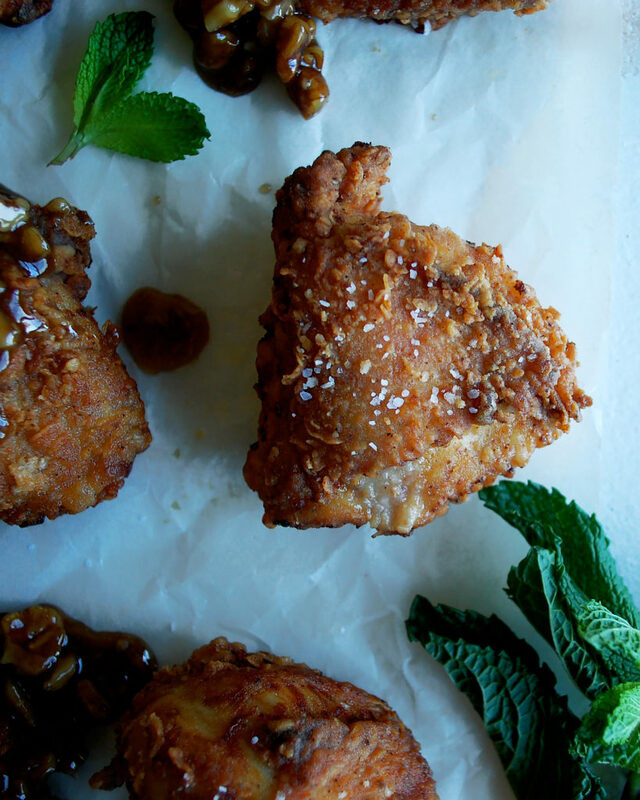 I’m talking the crispiest, most tender, most indulgent piece of fried chicken I have ever tasted. I was helping with a demo at 9:30am, and in comes a tray of sizzling fried chicken for a tasting in the other room. I hadn’t even had breakfast yet but the smell alone made me reach for a piece. 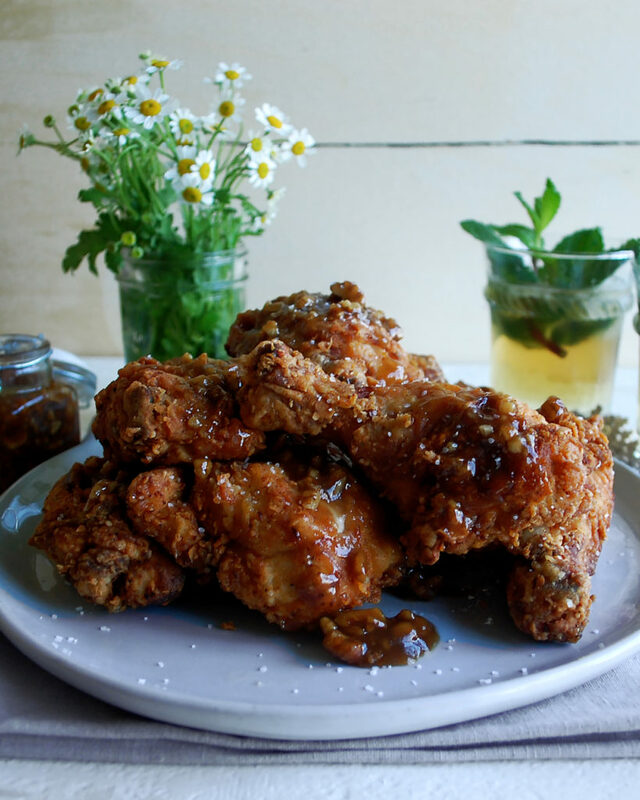 After going on and on about how good it was, I found out that Asha’s fried chicken has been praised as one of the country’s best fried chicken by Bon Appetit, along with a numerous amount of other publications. It definitely lived up to this claim. 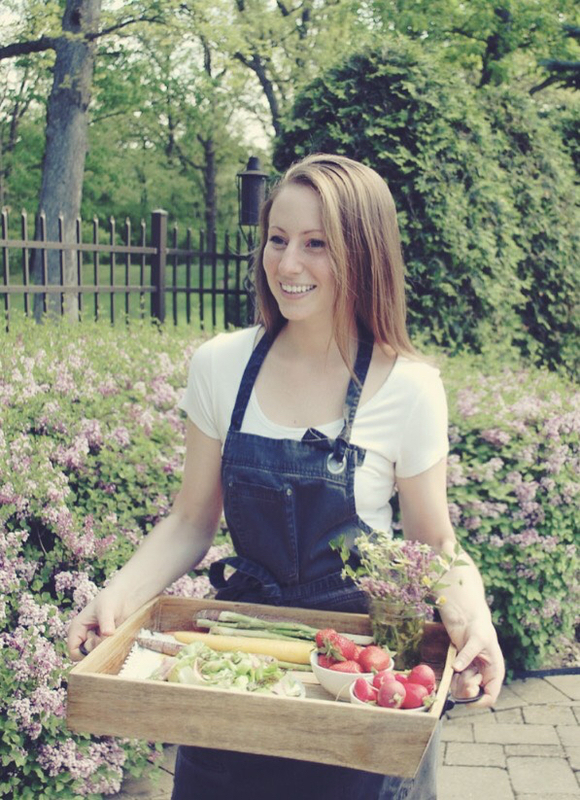 Asha’s biggest mark on the culinary world is her use of spices. Her chicken was marinated with a whole variety of spices for 3 days before being deep fried. The finishing touch was a generous sprinkle of fried curry leaves. The flavors were unique and out of this world. And the texture… unlike anything I’ve ever tasted. Let’s just say since that day, I’ve been waiting to get my hands on some chicken and see what I could do with it to even remotely compare to what Asha had made. I decided to go with a spicy buttermilk marinade, simply using cayenne and paprika for the heat, to soak the chicken in overnight. The buttermilk tenderizes the meat and adds a slight tangy flavor. For the chicken, I started with a whole chicken and broke it down into the following pieces: 2 drumsticks, 2 thighs, 2 wings, and 2 chicken breasts cut in half (so 4 breast pieces total). If you’re unfamiliar with how to break down a whole chicken, you can absolutely buy precut, skin-on pieces. I’m also thinking of doing a whole chicken breakdown demo post soon, so you’ll be able to see a super simple way to do it yourself. Anyways, so after the chicken sits in the buttermilk marinade, I let it drain slightly and then give it a very, very heavy coating of flour. This was one of the biggest things I noticed with Asha’s chicken, it had a very thick fried exterior. I season the flour with more spices to make sure the flavors come through on the chicken. The frying should take place at about 350F. I use a Le Creuset Dutch Oven with enough oil to come about 2 inches from the top. 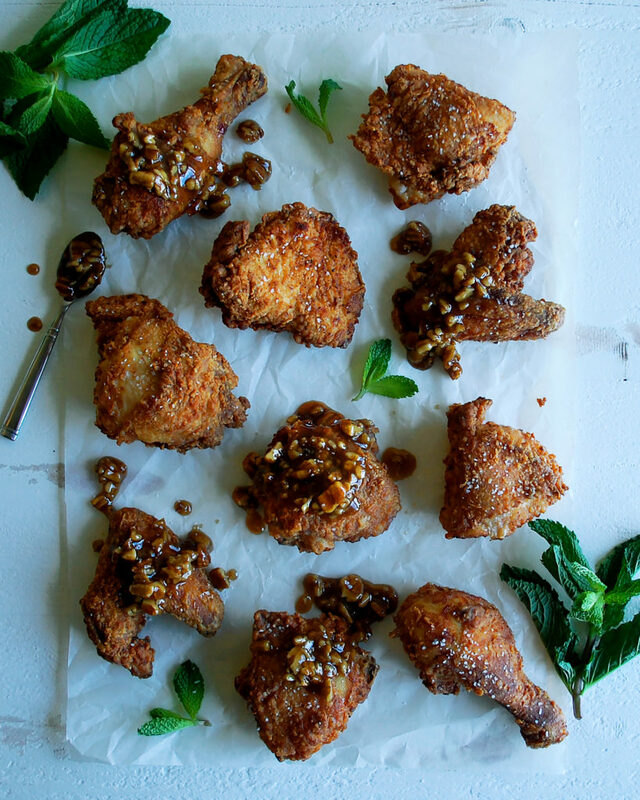 Patience is key to get beautifully dark, golden brown, crunchy pieces of fried chicken. When they’re still hot, sprinkle the pieces with salt. Now, since it was Derby Day, I had to add a bourbon pecan glaze, of course. 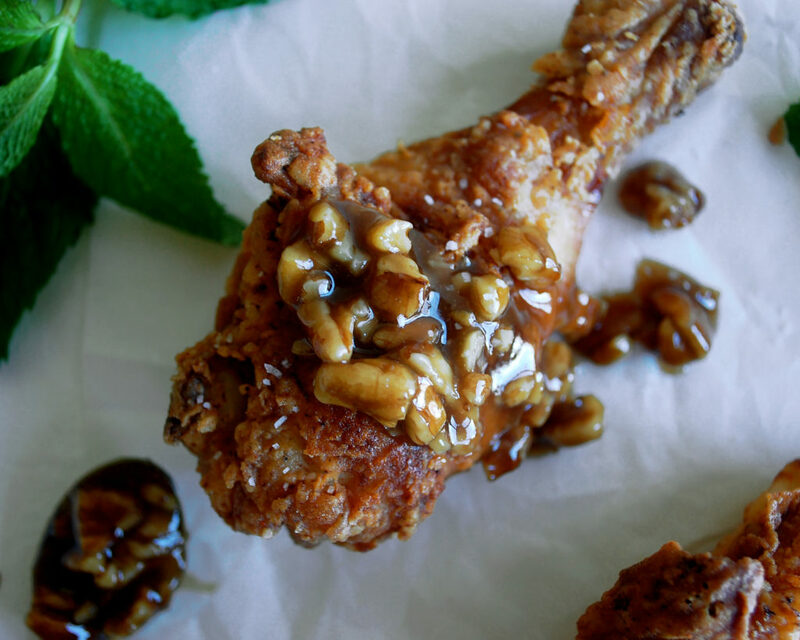 Sugary, nutty, with a subtle hint of bourbon…this glaze is so perfect to calm the spice of the chicken. It’s seriously just a down home, southern comforting combination. Make this for Derby Day, or bet yet, make this any day you want. Trust me, it’s so worth it. Enjoy! Break the whole chicken down into 2 drumsticks, 2 thighs, 2 wings, and 2 chicken breasts (you can also buy these pieces separately, skin-on, bone-in). Cut the chicken breasts in half. In a large mixing bowl, whisk together the buttermilk, salt, cayenne pepper, paprika, granulated garlic, mustard powder, and black pepper until fully incorporated. Submerge the chicken in the buttermilk marinade. Cover and refrigerate overnight for at least 12 hours (and up to 3 days). Fill a large, heavy-bottomed pot (I use a 9qt Le Creuset Dutch Oven) with oil, leaving 2 inches of space from the top. Heat over medium heat until the oil reaches 350F. Maintain this temperature as you fry the chicken. In a large mixing bowl, whisk together the flour, salt, cayenne pepper, paprika, granulated garlic, mustard powder, and black pepper. Set up a rack on top of a sheet pan. Transfer each piece of chicken from the marinade to the rack. Let drain for just about 30 seconds. Individually coat each piece of chicken in the flour mixture, pressing the flour firmly to the chicken in the bowl so that it creates a thick coating. Place the floured chicken back on the rack. Preheat the oven to 350F. Work in batches to fry the chicken in the hot oil until deep, golden brown. Each batch should take about 8-10 minutes. 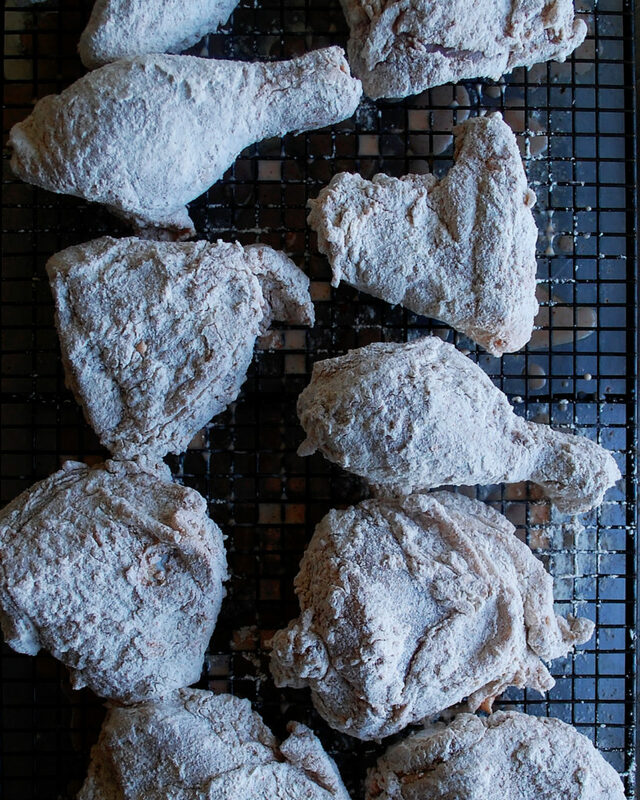 Transfer the fried chicken to a clean sheet pan lined with paper towels. When all the chicken is done frying, remove the paper towels from the pan and pop the chicken in the oven to finish cooking/heat through, just about 5 minutes or so. 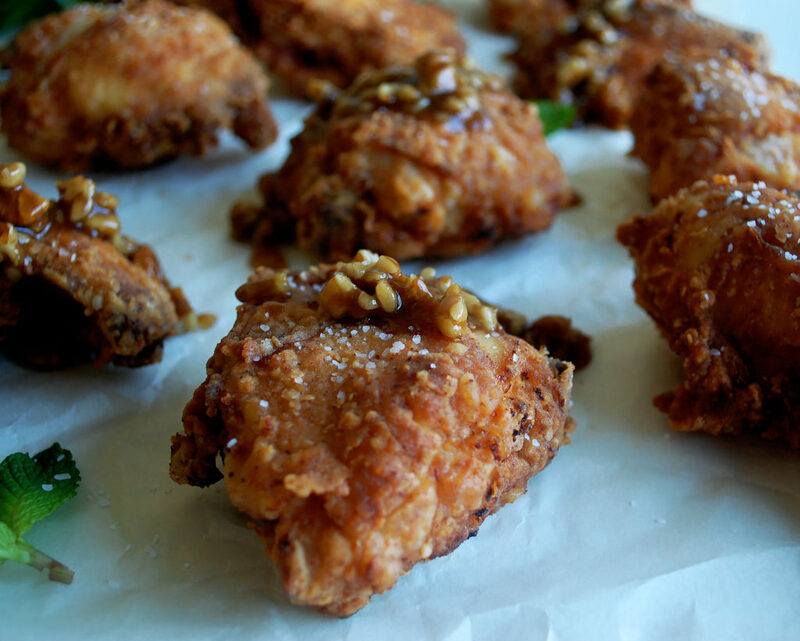 When you begin frying the first batch of chicken, start the glaze. Add the bourbon to a small saucepan and let reduce for 20 minutes on medium-low heat, or until reduced to about 2 tablespoons. Turn the heat to low and gradually whisk in the butter, piece by piece. The mixture should be thick, emulsified, and pale in color. Stir in the brown sugar and add the pecans. Let bubble and melt together. If the glaze becomes too thick, add water. If the glaze becomes too thin, reduce it longer. It should be able to easily drip off a spoon. 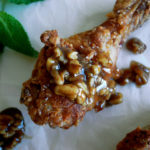 Serve the fried chicken with a big spoonful of bourbon pecan glaze. Yes, it was quite delicious!! !